The man seems to have been created by the gods just right to have a mixture of both parents. He has the snowy pelt of his mother, it would have been otherwise interrupted, if not for the ash and soot that his father tainted him in and the rosettes from his mother, which are placed on his left side. His face is dark and covered in the thick soot. Two eyes protrude from his face, one is a sky blue, similar to his mother’s, in his left eye is silver and gold, like his father’s. In between his eyes, on the bridge of his nose, are two grey stripes. His muscular legs are covered in dark, short socks as if his paws have been dipped into the abyss. His stomach seemed to have also been stuck into the abyss. 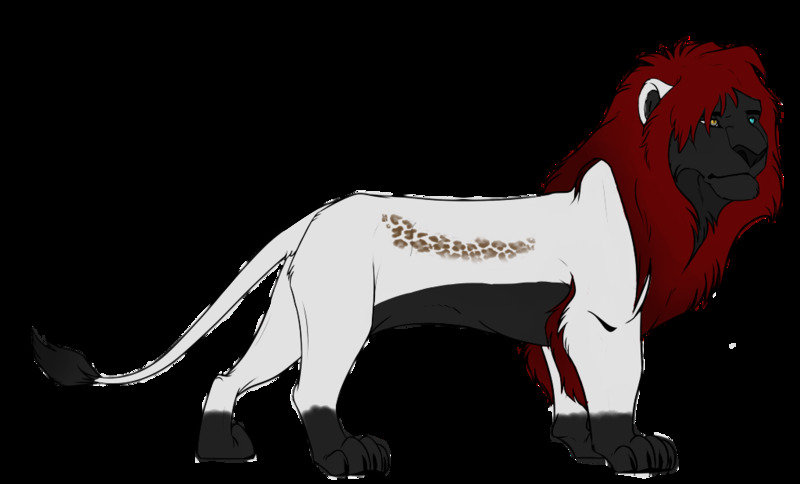 His mane is a shade of red and tail tip is black. The large boy will most likely be covered in scars and muscle when he gets older. He is the smallest you can be in the large bracket, and he is not exactly proud that he’s shorter than his father. Protective- Sandor is extremely protective of those he cares about and loves. He won't let harm come to them if he can help it...even if they want to handle it on their own. Respectful- Groomed for leadership, Sandor can be respectful and cordial, but he has a long way to go before it is mastered. He still lets his true feelings slip through. If he doesn't like you or what you are saying, one way or another you'll know...unless you are just oblivious. Loyal- Sandor is loyal until he is betrayed or feels he is betrayed. The only family member he has never been loyal to was Naida, but the rest of his blood family have his loyalty- something that will eventually get him caught between a rock and a hard place. He is also loyal to the pride he serves, though he is not mindless in his servitude. He is not afraid to ask questions and voice his opinions- even if it doesn't agree with the leader. Angry- Sandor has a bit of an anger problem, caught between rage and pure aggression, this is not the guy you want to anger. He can lose control, letting his emotions take control and can become extremely violent during this time. Private Message: Send Sandor a private message. [ CHARACTER ] Appearance: The man seems to have been created by the gods just right to have a mixture of both parents. He has the snowy pelt of his mother, it would have been otherwise interrupted, if not for the ash and soot that his father tainted him in and the rosettes from his mother, which are placed on his left side. His face is dark and covered in the thick soot. Two eyes protrude from his face, one is a sky blue, similar to his mother’s, in his left eye is silver and gold, like his father’s. In between his eyes, on the bridge of his nose, are two grey stripes. His muscular legs are covered in dark, short socks as if his paws have been dipped into the abyss. His stomach seemed to have also been stuck into the abyss. His mane is a shade of red and tail tip is black. 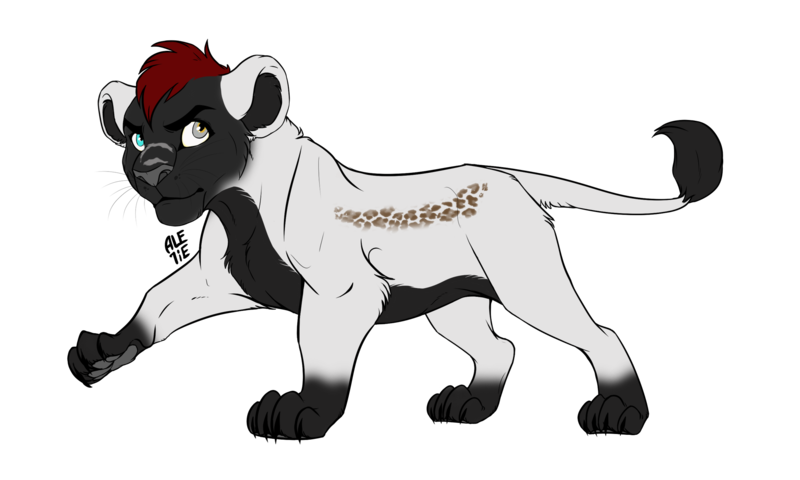 The large boy will most likely be covered in scars and muscle when he gets older. He is the smallest you can be in the large bracket, and he is not exactly proud that he’s shorter than his father.